Esophageal cancer is rare and complex. 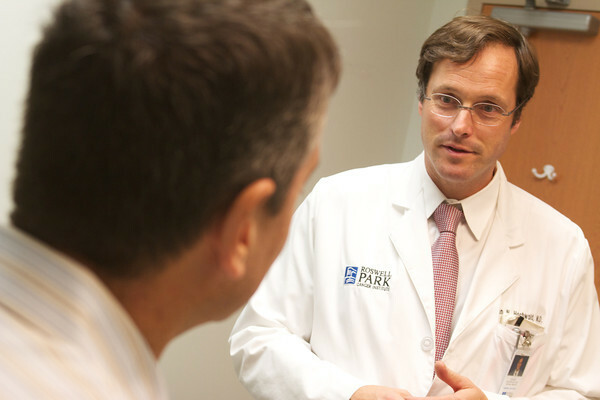 We believe every patient is unique and our esophageal cancer experts approach cancer treatment on an individual and personal basis. Our gastrointestinal team also treats many patients with Barrett’s esophagus, a condition that may lead to esophageal cancer. Roswell Park provides care for the whole person. While our surgical, medical and radiation oncologists treat the disease, our patients can also rely on a team of psychologists, social workers, dietitians and other professionals, who work together to provide a full spectrum of integrated care — all under one roof. We know every patient is unique. That’s why we deliver the highest-quality care, with a treatment plan tailored specifically for you. American Cancer Society’s estimates about 17,650 new esophageal cancer cases (13,750 in men and 3,900 in women) will be diagnosed in 2019, which is a 2.3% increase from last year. Esophageal cancer causes about 16,080 deaths from esophageal cancer (13,020 in men and 3,060 in women). Esophageal cancer is more common among men than among women. The lifetime risk of esophageal cancer in the United States is about 1 in 132 in men and about 1 in 455 in women. Esophageal cancer makes up about 1% of all cancers diagnosed in the United States, but it is much more common in some other parts of the world, such as Iran, northern China, India, and southern Africa. Cancer of the esophagus (also called esophageal cancer) starts in the inner layer (the mucosa) and grows outward (through the submucosa and the muscle layer). There are 2 main types of esophageal cancer; squamous cell carcinoma and adenocarcinomas.